Harrison Hot Springs, BC, Canada is a beach community located on the southern tip of Harrison Lake in the Fraser Valley. The resort village is best known for its world famous hot springs and summer lake activities. Top attractions, adventures and activities most enjoyed in and around Harrison Hot Springs, BC, Canada and the surrounding areas are sightseeing, beachcombing, swimming, boating, sailing, canoeing, water skiing, jet skiing, fishing, off roading, kayaking, mountain biking, hiking, golfing, spa experiences, downhill skiing and snowboarding. A few of the more popular, some would say best, activity destinations and sightseeing highlights located in and around Harrison Hot Springs, British Columbia includes Harrison Lake, Hot Springs, Kilby Provincial Park, Hicks Lake, Sandy Cove Trail, Harrison Grind, Miami Bridges Walk, Sasquatch Provincial Park, Harrison Beach Promenade and the Bear Mountain Trail. 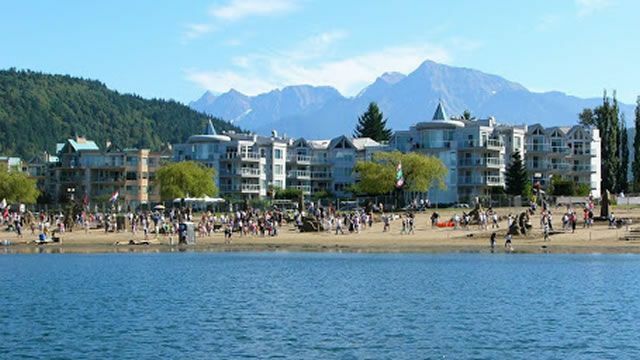 What are the Accommodations, Services and Amenities in Harrison Hot Springs, BC? Harrison Hot Springs places to stay, services and amenities important to travelers include accommodations (resorts, motels, inns, bed and breakfasts (B&Bs), vacation homes, cottages, cabins), campgrounds, tours, guides, attractions, restaurants, coffee shops, spas, grocery store, pubs, liquor store, bank, gas station, gift stores, and internet service. There are sightseeing attractions, historical sites, entertainment venues, and cultural events in and around Harrison Hot Springs, British Columbia. Some of the top museums, art, entertainment, and cultural venues to visit includes the Agassiz Harrison Museum, Kilby Historic Site, and the Sasquatch Museum. How Do I Get To Harrison Hot Springs British Columbia? Transportation services getting to and from Harrison Hot Springs, British Columbia include the main highway of course (Hwy #9), and then there is taxi, bus, car rental, marina, rail, and the (YVR) Vancouver International Airport (1 hour 41 minute drive - 143 kms) and the BC Ferries Tsawwassen Terminal ( 1 hour 31 minute drive - 143 kms) and Horseshoe Bay Terminal (1 hour 39 minute drive - 151 kms). eh! Plan to Visit Harrison Hot Springs, BC today.